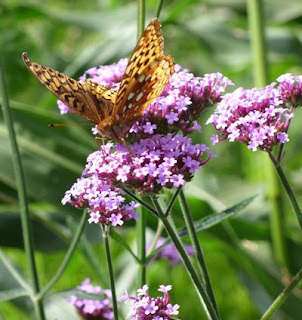 We've had a daily visitor to the verbena growing at the end of the garden. This was one of a series of gorgeous shots I was able to take one sultry afternoon in late August. Our visitor would lift off only to flutter back down, going in circles as it were, but making the most of it all day long. Only when the sun was starting to sink behind the treeline did it drift off. Hi. I find today your pretty blog. I enjoyed particularly your flower shots. Me too in http://jouvenceaux.blogspot.com have got some shots of flowers. Thanks for the link to my blog in your site, you're very kind indeed. Have a really nice Thursday.